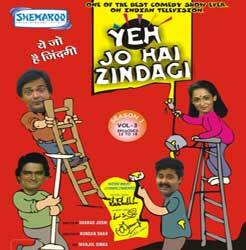 When we think of the Golden Doordarshan days, we can't miss “Yeh Jo Hai Zindagi”. And in this completely hilarious family comedy show, how can we forget Satish Shah, who moulded himself into various characters to make us laugh. He added spice in Ranjit and Renu’s life, by personifying various characters from our day to day life. Whether it's an Advocate, a Lottery Seller, a South Indian Father, a Doctor or a Grocery Seller…. he made us laugh!! !This DVD is an effort to create a Rangoli of Laughter by blending various colours of life through the different characters played by Satish Shah.In this Unique DVD pack, Satish Shah has selected 12 episodes of the favourite characters played by him.In exclusive interviews before each episode, he personally shares the beautiful moments he came across while shooting for this complete family entertainer. “For the first time in the history of Indian Television, a mammoth effort covering the entire gamut on Indian Culture. Heritage, Philosophy and Wisdom spanning more than 5000 years has been produced as a television serial titled ‘Upanishad Ganga’. The Vedic Culture is introduced in the initial episode (1-4). Then cultural values at the levels of the individual and the society are presented in the following 18 episodes (5-22). After thus establishing the cultural basis and ethos, the entire Upanishadic Wisdom is then presented in the next 20 episodes (23-42). The Practical steps that could be taken to actualize this wisdom in one’s life are then elaborated in the next nine episodes (43 – 51). The last episode is an expression of gratitude for this Wisdom which has made India proud, noble, and admired the world over. Director:Kundan Shah & Manjul Sinha. 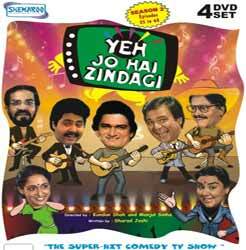 During early 1980s, YEH JO HAI ZINDAGI was one of the biggest hit shows to be shown on the Indian television. It was a laugh riot across the nation as the roads would get empty every Friday 8.30 pm; a fantastic way to end the week and welcome the weekend ! 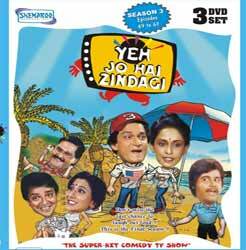 The episodes revolved around funny events in the lives of Ranjit (Shafi Inamdar) and Renu (Swaroop Sampat) - a married couple along with Renu's single & unemployed younger brother Raja (Rakesh Bedi). A trademark of the show was Satish Shah who played a different character in every episode, coming in contact with Ranjit & Renu's world. EPISODE 20 – TRUTH OR LIES ? 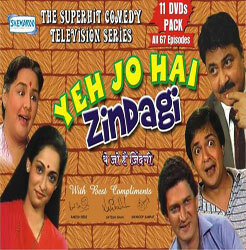 • Tiku Talsania’s famous dialogue “Yeh kya ho raha hai?” became a rage and was on everybody lips . .
During early 1980s, YEH JO HAI ZINDAGI was one of the biggest hit shows to be shown on the Indian television. It was a laugh riot across the nation as the roads would get empty every Friday 8.30 pm; a fantastic way to end the week and welcome the weekend! EPISODE 7 – GUESS WHO’S COMING TO DINNER? With Ranjit and Renu trying to upstage each other, they invite their respective bosses for dinner. Raja and Mr. Bhattacharya are roped in to help but what they do is beyond imagination. In all, a freaking mix-up! (…Continued) Renu refuses to do any household work, leaving Ranjeet and Raja in a fix. Both of them are unable to manage house hold work as they end up creating a mess. Renu comes to their rescue on one condition that they will lend her a helping hand henceforth, to which, they happily agree! The unthinkable happens! Raja falls in love. Ranjeet and Renu discuss Love, Life and Marriage with him, which results into a series of arguments. Watch out for what Raja does do in this situation, as for him, love means giving up! (…Continued) Raja is extremely scared of the thief and takes every visitor in their house as a thief. Thief does come to their house in disguise but is unable to fool them, as Renu tricks the thief with his weakness– the lovely ‘Gulab Jamuns’, and the thief gets caught with the help of these! - Signatures of Stars:-Satish Shah, Rakesh Bedi & Swaroop Sampat. A burglar in the guise of a sales girl enters Ranjeet’s household to make him the target of blackmail with the help of her husband. Ranjeet seeks Raja and Mr. Bhattacharya’s help, who get dressed in disguise (Police), frighten the burglars away. (Continued) Ranjeet is extremely happy with the thought of being a father. He brings home lots of baby care books and posters. He also asks Renu to take lot of care of herself and to avoid any hard work as precautions. Renu is amazed at Ranjeet’s unusual behavior and suggests a visit to the psychiatrist. Finally, during discussions the truth is revealed! Sitting unemployed at home, Raja gets depressed. Ranjeet’s friend offers a job to Raja in his departmental stores. Raja’s unique sense of salesmanship, initially drive away the customers. But then wonder of wonders happen when Raja makes the very owner of the store - a customer himself. Discover for yourself the uniqueness of Raja’s talent! A mix up of briefcases takes place at the airport. The unsuspecting Ranjit walks in after a tour with the briefcase of smugglers containing ‘diamonds’. The smugglers somehow locate Ranjit’s address and try to retrieve their briefcase. But to their dismay, smugglers find two more similar briefcases kept in the house, making it difficult to identify the real briefcase. A plethora of confusion erupts! Ranjeet’s elder uncle and younger uncle, who are business rivals, land up in Ranjit household at the same time for the same contract which both are aiming to get. The simmering war of uncles wreaks havoc on Ranjit, Renu and Raja. When the trio are at the edge of a nervous breakdown, peace happens all of a sudden between the two uncles. What is the ‘peace giving’ element? 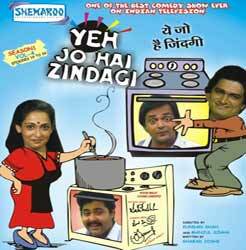 During the early 1980’s, Yeh Jo Hai Zindagi was one of the biggest hit shows to be shown on Indian Television. It was a laugh riot across the nation and the roads would get empty every Friday 8:30 pm. A fantastic way to end the week and welcome the weekend! The episodes revolved around funny events in the lives of Ranjit (Shafi Inamdar) and Renu (Swaroop Sampat) a married couple along with Renu’s single & unemployed younger brother Raja (Rakesh Bedi). A trademark of the show was Satish Shah who played a different character in every episode coming in contact with Renu & Ranjit’s world.